"The flavors in this elegant blend are reminiscent of Old Spain. This recipe mix makes enough to serve at a social gathering or to mix and give for holiday gifts. If desired, omit the confectioners' sugar and add honey to the milk to sweeten." In a large bowl, stir together the confectioners' sugar, coffee creamer, cocoa, orange zest, cinnamon and anise seed. Store in an airtight container, or separate into smaller jars for gift giving. 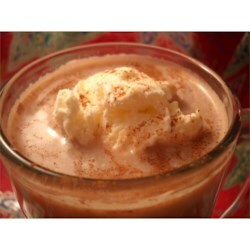 To prepare, mix 1/4 cup of the cocoa mix with 1 1/2 cups of hot milk or boiling water. An intense and rich Ethiopian spice is even better when made at home. Made this for Christmas gifts. It was hit with all to include my children. WOW! I used special dark chocolate cocoa. Not too sweet; just perfect....layered tastes. Definitely a keeper!